Dr. Amit N. Thakker Moderating a panel session the consist of African Leaders:H.E. 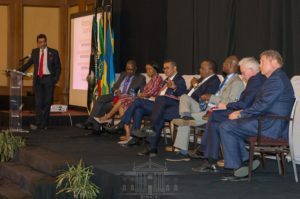 Uhuru Kenyatta (President of Kenya), Mrs. Tsitsi Maasiyiwa (Higherlife Foundation, Co-Founder and Co- Chair), Mr. Ade Ayeyemi (Ecobank Group, Chief Executive Officer), Dr. Tedros Adhanom (WHO, Director General), Mr. Peter Sands (GFATM, Executive Director), Dr. Seth Berkley (GAVI CEO), and Mr. Alex Asiedu (Africans for Africa, Chairman). H.E President Uhuru Kenyatta, President of Kenya, acknowledged that investments in health were integral to achieving the social economic agenda and that it was necessary to build partnerships to achieve Universal Health Coverage. 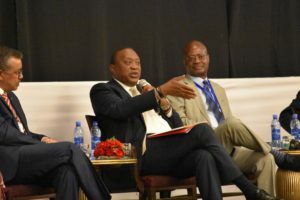 The Kenyan President urged other leaders to create an enabling environment for the private sector in order to build confidence and attract investments into health systems. It was stressed that the health sector is a viable investment area where the return on investment is substantial such that investors can expect between 9 – 20 times the level of investment. 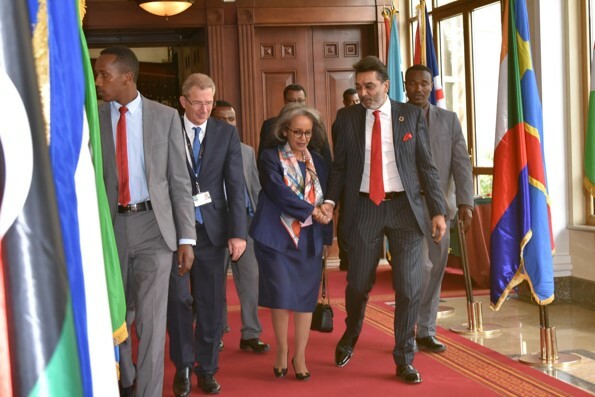 The meeting led to increased commitments of US$200 million from both public and private health sector and donor governments (Higherlife Foundation, The Government of Ireland and the Government of France), to end epidemics and achieve Universal Health Coverage.H.E. President Sahle-Work Zewde, President of Ethiopia, called on the African leaders to bring hope and opportunities to the people of Africa through transformational leadership Investments in healthcare would improve the quality of life across the continent and allow African populations to lead full, productive and prosperous lives. She emphasized that investments in healthcare underpin national development. Mr. Bill Gates, Co-Chair of the Bill and Melinda Gates Foundation, urged immediate action in order to end epidemics and meet health targets. It was suggested that African Ministers of Health should meet more frequently to work together on the health status in the continent and report their progress to the AU Heads of State and Government Summit. In this way, African governments can learn from initiatives across the continent, identify synergies that unlock efficiencies and collaborate in relation to continental priorities. 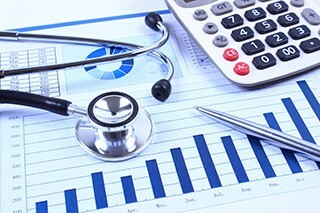 African leaders urged their counterparts to focus on improved efficiency in order to strengthen national health systems. For the private health sector, the meeting was received as a key step towards acknowledging sustainability and private sector efforts towards health outcomes. The meeting was an important platform to build on Public Private Dialogue, create awareness and commitments in relation to investments in healthcare in Africa and urge the African leadership to create an enabling environment for business. This shall lead to a stronger private health sector which can further contribute to economic development and goals towards achieving Universal Health Coverage in an efficient and affordable manner. TERUMO BCT a global leader in blood management, blood safety, therapeutic apheresis, cell therapy and cell collections. 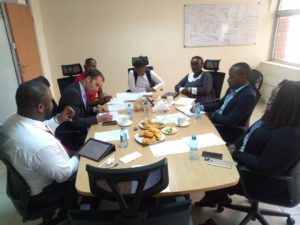 Terumo, opened its first office in Sub-Saharan Africa in Gigiri, Kenya on 7th February 2019. This happened after the company was recently listed in a recent industry report as among the world’s top players in the blood bank market. 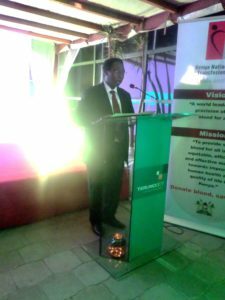 Dr. Jackson Kioko, Director for Medical Services (DMS), Ministry of Health, who also officially opened the new company, graced the ceremony. 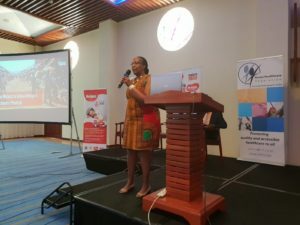 The Cabinet Secretary, Ministry of Health (Kenya) Mrs. Sicily Kariuki in her speech that was read by the DMS, Dr. Kioko, applauded TERUMO BCT for the great achievement and for choosing Kenya as their base in Sub-Saharan Africa. She further said that the partnership is very timely as Kenya is working on making Universal Health Coverage a reality and blood and blood products are key. Officials from the Japanese Government and TERUMO BCT emphasized that their decision on choosing Kenya was informed by Kenya being a high recipient of Official Development Assistance (ODA), an agreement that was signed during Sixth Tokyo International Conference on African Development (TICAD6). The conference focused on “Advancing Africa’s Sustainable Development Agenda – with a major theme as promoting resilient health system for quality of life.” Kenya’s prioritization of healthcare by driving the health agenda as reflected in the BIG 4 Agenda further incentivized their move. 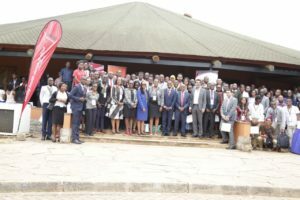 As a company, TERUMO BCT will apply three strategies through it’s partnership in Kenya: Create awareness, Capacity building and training of blood bank technologists and professionals and Use of advanced technology & systems. The company officials emphasize that they will proudly share their knowledge and experience in blood safety and blood bank. Through sharing of knowledge and expertise, the company will contribute towards saving lives especially mother and child, achieving Universal Health Coverage and achieving Sustainable Development Goals (SDG). Kenya Healthcare Federation held the initial county stakeholder engagement with Meru County Health Officials to discuss the establishment of Meru Medical Care. The meeting was held on 10th January 2019 at KHF offices. The engagement with the county was very timely because KHF has set a goal to establish county stakeholder engagements. The Governor, Meru County, has laid a plan to establish Meru Care that will ensure all households have medical cover. The cost of Meru Care is proposed to be ksh. 2,000 per household annually. Meru County has a population of 1.56million people with 2000 health workers, which gives a ratio of health workers to population at 1:780. Meru Level 5 Hospital is the main teaching and referral hospital and has specialists. The county has one Level 5 hospital, 15 Level 4 hospitals, 25 Health Centres, 157 Dispensaries and 76 Pharmacies. Dr.Githu Wachira from the Ministry of Health-Non-Communicable Disease Unit, Meru County, said that Meru County is leading in the burden of NCDs with Gastrointestinal Tract (GIT) cancer being very common. He further said that research is ongoing to determine the trigger factors for the GIT cancers. Trauma is the second leading cause of NCD morbidity with a major cause being assaults. Dr Lillian Karoki, Director of Medical Services, Meru County informed the meeting that the total county health budget received from treasury is Ksh. 3.2 billion. 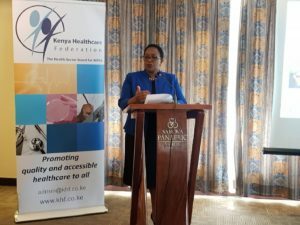 She further said that 85% of the total population can afford to pay National Hospital Insurance Fund (NHIF) subscription; the challenge is they do not keep up with the monthly contributions thus bringing the current active NHIF membership to as low as 7%. KHF was pleased with the vision of Meru County as regards their health agenda. KHF advised that the County should explore ways to increase revenue for the health facilities to make them self-sustaining. Commodity management is important in ensuring that limited resources are used appropriately and loss through pilferage is minimized. Given that 85% of the population can afford NHIF, the County could establish the Meru Care to target the medical needs for the needy. KHF further advised the County to consider licensing Meru Care as an official scheme with transparency in revenue collection, revenue allocation, benefits, beneficiaries and provider management. This would enable the scheme to purchase healthcare services and products competitively. It was also proposed that the County share their proposal for Meru Care with KHF who can assess the benefits package for validity and sustainability. KHF expressed willingness to assist Meru County with advocacy and lobbying to justify the budget for Meru Care and to bring the vision into fruition. 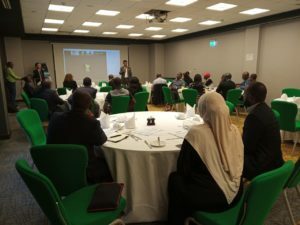 Crescent Tech Limited held a breakfast meeting at Parkinn Hotel in Westlands on 22nd November 2018, to discuss key challenges facing the healthcare facilities in Kenya. Some of the key issues highlighted were: Limited access to health care facilities, lack of adequate personnel and expertise to address the medical needs, poor Infrastructure where most facilities do not have the proper facilities to handle the medical challenges, ironically the facilities that are highly equipped with specialized equipment do not have effective processes and personnel in place to execute the tasks, access to medical records and Healthcare Financing. The breakfast meeting was organized by Crescent Tech Limited and Napier Healthcare who partnered so as to address these issues of access to healthcare services and also to offer solutions that will provide a seamless access to records and efficient delivery of services to even the most rural area in the country. For a healthcare facility to deliver quality healthcare, it should be well equipped with the right equipment and tools, quality medications, should be accredited, should have qualified and experienced staffs. 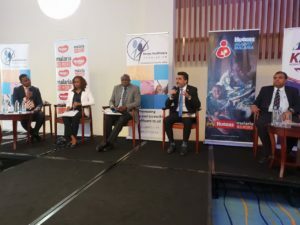 In Kenya, the healthcare sector is facing some setbacks in: supply chain, the facilities are understaffed, healthcare financing and innovations & technology. Once this set backs are looked into, the delivery of quality healthcare will go a notch higher. 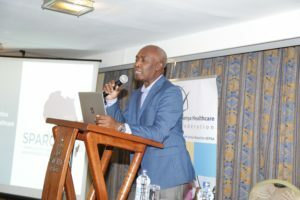 In his opening statement, Dr. Percy narrated a direct experience of how the above mentioned challenges impacted and eventually led to the loss of their C.E.O, the late Mr. Kennedy Mbwaya, who was in urgent need of medical attention while in Eldoret for a business meeting. Thereafter, the ambulances services arrived late, and it was a challenge identifying a center that could perform an endoscopy. When that was established, an appointment was required to be made so as to access the services of a specialist. This whole process greatly affected the speed at which his life could have been saved. 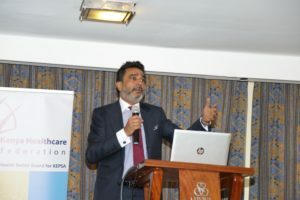 According to Dr. Amit N. Thakker, Chairman Kenya Healthcare Federation, the new constitution that brought forth the two arms of government, National and devolved governments gave capital to projects aimed towards the BIG 4 agenda, healthcare being one of them, through the Constituency Development Fund(CDF).Under financing of the health sector, our government has reduced its funding and this has posed as a challenge in the health sector. Over 80% of the country’s population is dependent on this funding for their healthcare needs. A very small percentage of Kenyans have access to private insurance and can afford to pay for their own healthcare expenses. This is less than 20% of the Kenyan population. 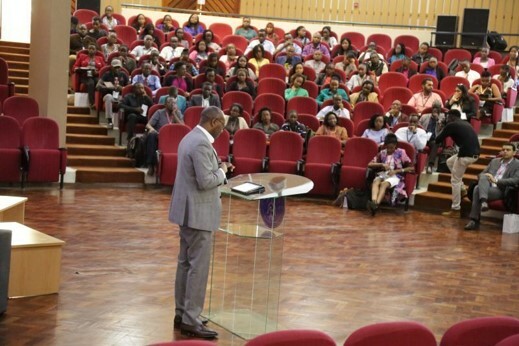 “Kenya has undergone quite some positive disruptive changes in governance and through the devolution of some services from the national government to the county government. As expected, this transition has encountered its challenges. In as much as we consider our country as having highly skilled specialized staff, we still do not have available workers to provide for healthcare services to the larger population. The people who mostly need these services, still have challenges accessing the services of specialized health workers to assist them. 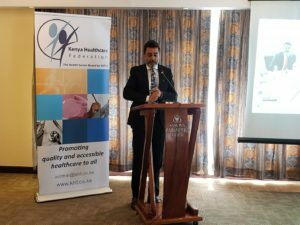 There is an urgent need to address this human resource and staffing issue through a proper policy in place that will boost the public health sector.” Dr. Amit N. Thakker, Chairman Kenya Healthcare Federation. Recommendations towards solving the challenges as discussed in the meeting were: The general challenge of leadership and governance has trickled down to the health care sector. 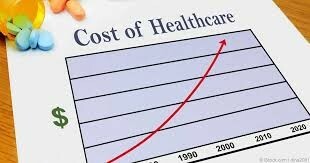 Allocation of resources has been hampered by poor governance and the lack of accountability in the use of the resources allocated to the healthcare sector therefore, the Government should accelerate discussions and implementation of public-private partnership initiatives for creation of sustainable models for healthcare financing to achieve Universal Health Coverage. 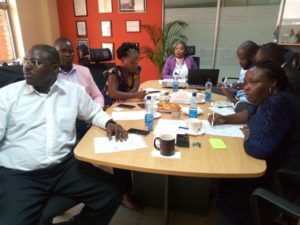 Kenya Healthcare Federation(KHF) Healthcare Financing committee held it’s last quarterly meeting at KHF offices on 7th December 2018 the meeting was chaired by the committee chair Dr. Njoki Fernandes. The key agenda for the discussions were: Universal Health Coverage, Doctor’s price guidelines and NHIF amendment Bill. Dr. Walter Obita, director representative for the committee updated the committee on the discussion around Universal Health Coverage that has been going on at the ministerial level and the last engagement between the Ministry of Health led by the cabinet secretary Mrs. Sicily Kariuki and the private Health Sector. 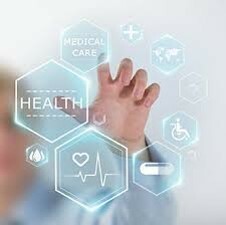 Healthcare Financing Committee has been leading all the discussions around Universal Health Coverage where the committee has also been engaging with the government at the technical working committees(TWCs) set by the national government. Dr. Obita has been representing KHF healthcare financing committee in the TWCs. From the UHC discussions in the ministry of health ,the current position shows that the government is not going to use the social insurance schemes to roll out UHC. Hence it plans on directly procuring or paying for commodities through Kenya Medical Supplies Authority( KEMSA).The counties will therefore have to roll down the payments made to KEMSA by directly making orders to KEMSA where KEMSA will make the deliveries. Inadditional,the government is going to allocate some resources to the public health activities,community health activities and 80% will be used for commodities and supplies to KEMSA. 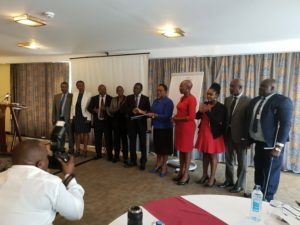 The counties have been tasked with a role in ensuring that all other health systems are built through allocation of finances to each of the activities which include:Human Resource recruitment, deployment and management, Strengthening of governance structures and management of data, information and technologies . Dr. Fernandes brought to the attention of members the NHIF amendement Bill with a major focus on section 2a) part II which states that there shall be paid into the fund the employer contributions matching employee’s contribution, Part III. such monies as may be appropriated by the National Assembly out of the Consolidated Fund, for persons certified by the Board to be unable to pay the contributions, Part iv. Gifts, grants or donations, Part v. Funds from the National Government, County Governments or employers for the administration of employee benefits and section five ,Part vi ,to administer employee benefits on behalf of the national government, the county governments and employers in respect of their employees. 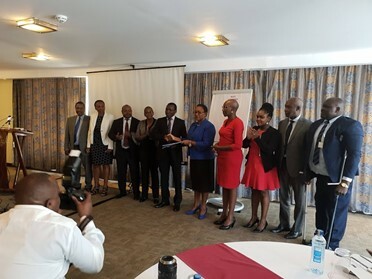 KHF’s recommendations included: should discuss this bill with the parliamentary Health Committee, Lobby in, Federation of Kenya Employer(FKE) and KEPSA and Healthcare Financing Committee to be involved in all the discussions. There was a parliamentary directive that the Doctor’s rate should be taken back to 2006 price guidelines that were abandoned two years ago with the adoption of the current rates. The National Assembly’s Health committee further requested the Cabinet Secretary, Ministry of Health, Mrs. Sicily Kariuki to replace the existing Medical Practitioners and Dentists Rules 2016 with the second edition of the Professional Fees Rules and Guidelines of 2006, which prescribe cheaper rates for various medical services and procedures. KHF’s recommendations as a way forward for the doctor’s price guidelines include: KHF should get more involved in costing and also learn from the successes of other countries and professionals, KHF should engage more health experts especially health economist to join in the discussion to guide in making more sound decision, Healthcare Financing should be more engaged in the discussions so as to deter NHIF from charging high rates ,the medical board should consider setting up maximum rates instead of minimum and there should be maximum margins set for pharmaceuticals and supplies which will also bring about price regulations. Other issue as discussed was the quality of care which has been compromised and the public is not well informed on where to seek care from. Therefore the committee suggested that there should be edu-information and sensitization done to the public on who to go for care. There should also be regulations on healthcare providers at all levels in which they should have the right qualifications and experience. The committee agreed on the focus areas for the year 2019 as: NHIF Amendment Bill, Doctor’s Price Regulations, Pricing Quality and Regulations ( this will focus on care services and medications) and engaging the media in Agenda setting.